Tiger Bird’s soaring debut is like hen’s teeth | Stand, spray and deliver. A rare event pertaining to a Bird has had fanatics of the uncommon reaching for the digest and binoculars over the course of the last few months. What has developed has been spoken of in the same light as sightings of the rare short-billed black cockatoo. This scant treasure has been unearthed in the southern parts of Australia over the summer months of 2011/12 and may be on the verge of entering celebrity parrot status. The word is the Bird. Jackson Bird. Your forgiveness is sought if I have wrongly caught the attention of any readers who were actually looking to study something about a sparse species of the sky or anything relating to chicks. The other chicks. The Bird: is he celebrating or asking for a referral? The purpose of this is to draw your attention to a stupendous Sheffield Shield campaign by an unheralded kid who carries out his yakka for the Tasmania Tigers. 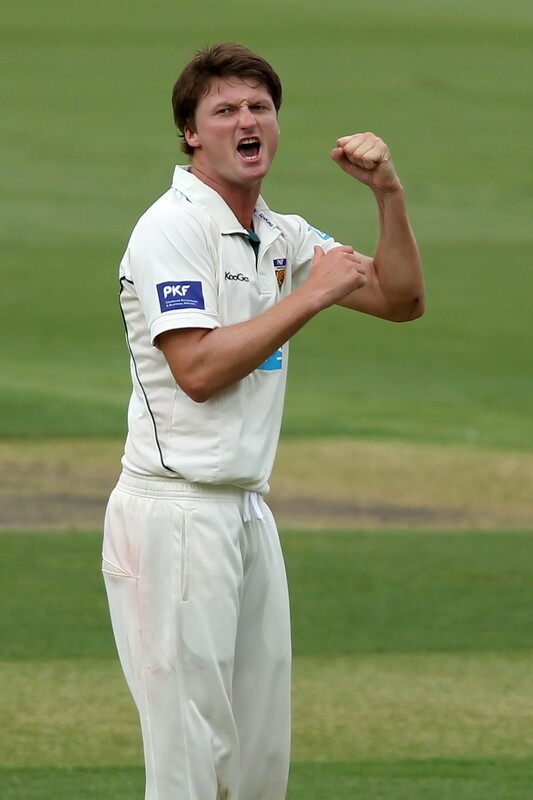 Jackson Bird is a 25 year old right-arm quickie who hails from the rich and prolific talent aviary in Sydney. Due to the dearth of options in his home state, he flew the coop southwards to forage and now he’s hit the seed and nectar mother load in the Apple Isle. This Shield campaign he has crapped on opponents and records from a great height with the elegance of a peregrine falcon. In his first year out of the nest, he has taken 48 wickets at an average of 15.75; a record haul for a debutant in Shield cricket. He took 5 wickets in an innings on 5 occasions and 10 in a match twice. What’s more, you can add a hen’s teeth hat-trick to this exceptional achievement just to boost the scarceness of the whole effort. He’s been concealed high in the bushy trees of the under-exposed Shield season up until now but his anonymity may just be about to expire. The word on the street is that the selection panel toyed with the idea of an inflated tour party for the West Indies test series and that the last bowler’s spot may have come down to a cockfight between Mitchell Starc and the Tassie flyer. Some would relate this to comparing an eye-catching rainbow parakeet to a common vagrant ibis, but at the end of the day, who knows how the bird-brain of a selector works? Even though he’s been left to roost back at home for this tour, we need to get the messenger pigeons on standby with this memo; the Bird is perched and ready to swoop. This is surely not the last time we’ll be hearing his name after his starling efforts of 11/12. It is obvious that the Tassie Tigers provide a classier brand of bird seed. Plus we all know the water is better way down south,especially when infused with an alcoholic content. You know, the first time I heard of this chap was from this peice, and then the next day he gets shield player of the year! Nice work E-man! With stats like those he will defenitley be in the mix shorlty, especially with the way the bowler injury rotation system is working at the moment. Every mug can’t string more than 3 games together. Poor old Mitchy Johnson must have the shits, here’s another bloke who’ll get a go before him.